The latest advance is a $20 million redevelopment of the Marion Hotel, which is now welcoming patrons to a bigger bottle shop and new front bar. The development, announced in 2017 with an original budget of $13 million, is aimed at capitalising on significant new investment in the region. A major driving force has been the Tonsley innovation precinct with its 850-home, $265 million residential development. Further business is likely to be generated by the revamped hotel’s proximity to Flinders Medical Centre and Flinders University – offering the prospect of conference business. Marion Hotel proprietor Jenny Hurley, of the Hurley Hotel Group, said work on the first phase of the project was nearing completion. A garden bar and gaming room should be operating by June, and dining room and function spaces by August. The piece de resistance, a four-storey, 62-room motel – up from 12 rooms in the old pub – is also on track for an August reveal. Events at Marion’s SA Aquatic & Leisure Centre were also a consideration. She said the development would add about 40 new jobs, raising the hotel’s staff to more than 100 overall, including casuals. “We employ a lot of young people, as well as older people, that’s the beauty of the hospitality industry,” she said. Mrs Hurley said the accommodation was the development’s driver. “We had 12 rooms before, and we also own the Tonsley Hotel, which has 20 rooms,” she said. “Occupancy rates across both were consistently running at well over 80 per cent, and often sat at 100 per cent. “We realised there was great demand for accommodation the area. “The function rooms will also be a focus – there’s not a lot of hotels in the area that do weddings, for example. Hurley Hotel Group chef Dave Pedro, recently returned from the Port Lincoln Hotel, is behind a revamped menu focusing on smoked dishes, sharing plates, meat and seafood. 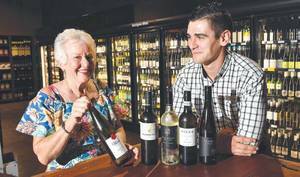 “Dave got to know a lot of seafood suppliers in Port Lincoln so really he appreciates fresh seafood,” she said. The look throughout was contemporary, “a little bit industrial, a little bit quirky”. Hurley Hotel Group bought the 1966 hotel on Marion Rd from the original owners in 1984. Mrs Hurley said the area had several good hotels, including the Warradale and the Morphett Arms, but there was “not much hotel-style accommodation in the area”. “So there really was a need,” she said. The hotel is also a new sponsor of Glenelg Football Club.